On palm-lined, porticoed Las Olas Boulevard you're likely to wander through an outdoor art exhibition on your way to boutique shopping, or bump into locals on their way to a Mad Hatter's Tea Party in an old mansion - and Riverside Hotel is the boulevard's only hotel. Just behind the property, Fort Lauderdale's New River stretches down to the Broward Center for the Performing Arts. Watch yachts cruising down the New River while enjoying a cocktail at the outdoor pool and sundeck. Rooms come in three styles - Classic rooms in Tommy Bahama décor, Traditional, and oversized Executive Tower rooms. Book a Tower Room for views of the Fort Lauderdale skyline, the Atlantic Ocean, and the river. WiFi is free everywhere; high bandwidth is available with a fee—with discounts for Stash Members (see Amenities for details). On the New River, The Riverside Marina has boat dockage for your vessel up to 150 ft. Security patrols and cameras keep it safe, 24/7. Indigo Restaurant serves classic American steaks and seafood, and you can dine al fresco on Las Olas Boulevard. 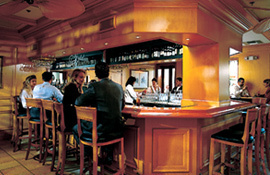 At The Golden Lyon there's light pub fare to go with your drink, and Preston's Lounge offers cocktails and a cheerful, busy Happy Hour. Named one of the "10 hottest restaurants in Fort Lauderdale" by Miami Eater, the Wild Sea Oyster Bar & Grille's cuisine ranges from seasonal fresh seafood to one-of-a-kind, sustainable entrees. In-room dining from Indigo's menu is also available. From boardrooms to ballrooms, Riverside's 10,000 sq feet of flexible space, state-of-the-art AV equipment, and event professionals are at the ready for meetings, weddings, champagne receptions, or any other event you can dream up. The Riverside Hotel is on Las Olas Boulevard, 5 minutes from the white sands of Fort Lauderdale Beach. The Fort Lauderdale/Hollywood International Airport, Greater Fort Lauderdale & Broward County Convention Center, and Port Everglades are 10 minutes away. Accommodates vessels up to 150 ft.
Reservations must be cancelled 48 hours prior to arrival to avoid a penalty of one night's room and tax. Inspire your colleagues with cutting-edge technology and intuitively designed meeting space at the River side Hotel. Discover how a touch of classic Florida charm can enhance your next event. Select from a variety of venues spread across 11,000 square feet of versatile meeting space. Host a conference in the HImmarshee Ballroom or New River Ballroom, which both offer 2,800 square feet of space, and utilize the state of the art audio-visual technology to make your presentations come alive. You can also plan more intimate meetings in our boardrooms. No matter which venue you choose, your event will be a guaranteed success with the help of their attentive staff.